In this busy world it can be a challenge to eat healthy during the week. It takes time to get the right ingredients and prep a healthy meal…and fast food is just so available and quick it can be hard to avoid! These recipes are so easy to whip up and way yummier than anything you can get in the drive through. None of these Simple and Quick recipes take longer than 10-15 minutes to make and they will leave you feeling much better than a burger and fries. These spicy wraps pack a punch, both in flavor and protein! Use your favorite wrap or if you prefer pita bread, use that instead! Eat with corn chips and your favorite salsa for a yummy southwest lunch. These wraps keep great in the fridge! In a small pan heat the oil. Once hot add onions, bell peppers, garlic. Cook for a few minutes or until onions are slightly browned. Add beans and taco seasoning and cook another 2-3 minutes. Remove from heat. In a separate bowl stir together the avocado, cilantro, lime juice, and a pinch of salt and pepper. To assemble lay your tortilla on a plate, spoon some sour cream on and spread it out. Then add a few spoonfuls of both the avocado and black bean mixture, then wrap up that wrap and you are good to go! This simple and quick salad recipe is yummy and versatile by itself, but there are so many options to dress it up! Scoop it up with pita chips, eat it in a pita pocket, put chicken on top, even mix it with salad greens! The lemony vinaigrette makes all the flavors pop and this salad will taste even better on day two. Get out a large bowl and a small bowl. In the large bowl mix together all the chopped veggies, herbs, and feta cheese. Toss it well so it is really mixed up! In the small bowl, mix together all the ingredients for the dressing. Once you have it well mixed pour the dressing over the salad and toss the salad again! This classic sandwich is so delicious! Crunchy, sweet and tangy flavors that just taste so fresh all together. You can eat this as a sandwich on grainy bread, in a pita or wrap, or just serve in a bowl as a salad! In a medium bowl combine chicken, grapes, celery, apples and walnuts. Keep in fridge while you make the dressing. In a smaller bowl combine mayo, yogurt, honey, vinegar, salt and pepper. Pour the dressing over the salad and mix until evenly coated. Serve as desired! Another classic salad. The fresh summery flavors are abundant in this dish: sun-soaked tomatoes, earthy basil, fresh mozzarella, and complex balsamic dressing complimenting everything. This simple and quick recipe is usually served as a salad, but is also a delicious topping for crusty bread. In medium bowl, toss tomatoes, mozzarella, and basil. Drizzle balsamic vinegar and olive oil over it and add salt and pepper to taste. Toss well and serve immediately! A little prep work will go a long way. If you are doing prepping lunches for the week simply double the recipe to make enough for a few days! 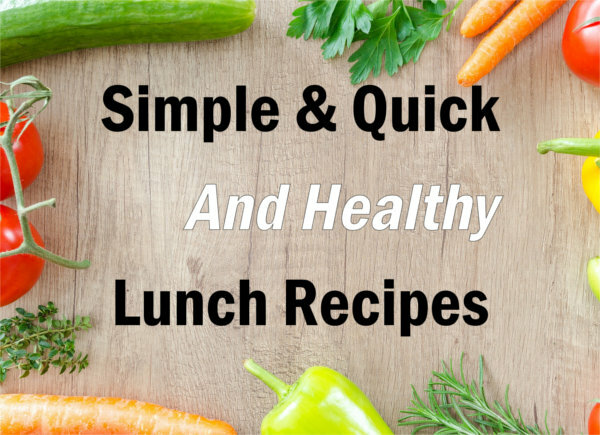 Hopefully these simple and quick recipes will help keep you eating healthy throughout the work week and avoiding fast food or junky snacks! Modernistic has been providing Simple & Quick solutions to Michigan residents for over 45 years! Trust the experts to make your carpet cleaning, air duct cleaning, and upholstery cleaning needs as easy as possible! Winter is coming! Our warm summer temperatures are dropping, and we can confidently say that fall is on the way here in Michigan. Ok, confidently might be a strong word; we all know what Michigan weather is like! Before making any changes to your heating and cooling system, have a professional give your home a thorough HVAC inspection. That way, you can find out exactly what your system needs to perform its best. Personalized attention from a professional is always the best way to go, but chances are your home could benefit from the rest of these tips! One of the best things you can do for your ventilation system is changing the air filter every 3 months! Capturing and removing all the dust, allergens, and other tiny particles is a great way to keep that unwanted junk out of your ductwork and out of your home’s air. Depending on various factors, like whether or not you have pets or if you are susceptible to allergies, you may want to change your air filter even more frequently. A great way to make sure the warm air circulating in your home actually stays in your home is to make sure your attic has proper insulation. If you haven’t checked it recently, head up there and see what’s going on. An easy way to tell if you need more insulation is if you can see the ceiling joists. Proper coverage will obscure the joists, making sure you don’t lose any more heat than you have to this winter! If you don’t have one already, go out and buy a programmable thermostat! Also, learn how to use it! There are many times throughout the day where your furnace doesn’t need to put out as much heat, and a programmable thermostat will help give your system a “rest” and keep it heating your home efficiently. Dirty or blocked air ducts will significantly drain your furnace efficiency! In order to heat your home effectively, warm air has to travel through many lengths of ductwork. If that ductwork is filled with soil, debris, dander, dust, and other conductive material, then guess what you’re paying extra for your furnace to heat up? Clogged ductwork will eat up your warm air before it even reaches the rooms you want it to, which is why it’s imperative to make sure your ductwork is clean prior to turning on your furnace for the winter. A thorough air duct cleaning from a professional with a truck-mounted vacuum system will increase your furnace efficiency by as much as 20-25%! These are some easy ways to get your HVAC system ready for winter that you can do in a weekend. 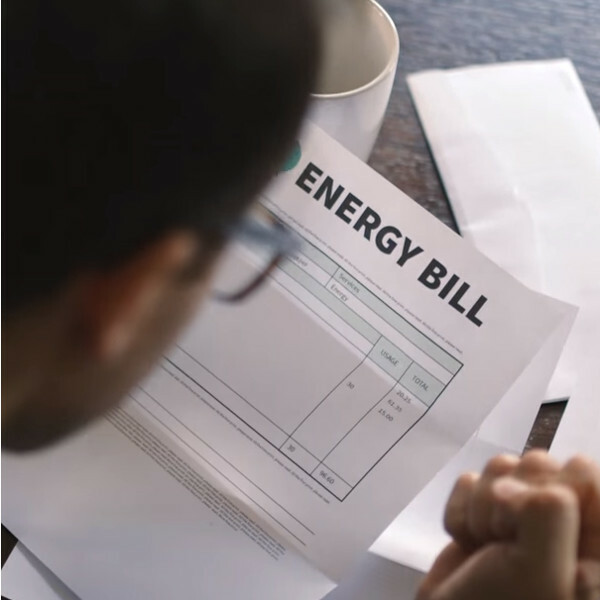 Just a little bit of preparation now will help you save money on your heating bills and help your furnace run more efficiently; it’s Simple & Quick! Modernistic has been helping Michigan homes get their HVAC systems ready for the last 45 winters and counting! Call or click if you need the most thorough air duct cleaning in Michigan to help your furnace this winter. When it’s time to clean your home, you KNOW it’s time to clean your home. It’s easy to see when the floors have tracked in too much filth, or when your countertops are looking rough. However you won’t always see how dirty the air in your home might be. Unless your home is filled with car exhaust or smoke, in which case… get out of there! That’s some seriously dirty air! Whether or not you can see the dirty air of your home, you’ll want to make sure you’re taking every step you can to keep it clean. With the amount of time we spend indoors, it is extra important we make sure the air we breathe in our homes is as clean as can be. The EPA (Environmental Protection Agency) estimates that we spend around 90% of our time indoors! That is a lot of time to be breathing in air potentially carrying any number of biological pollutants. Many of these contaminants are sourced from things you encounter on a daily basis without thinking about it all that much. Your air quality can be affected by just about anything under your own roof: your pets, excessive moisture, candles (or anything that burns), even certain types of wood and insulation. 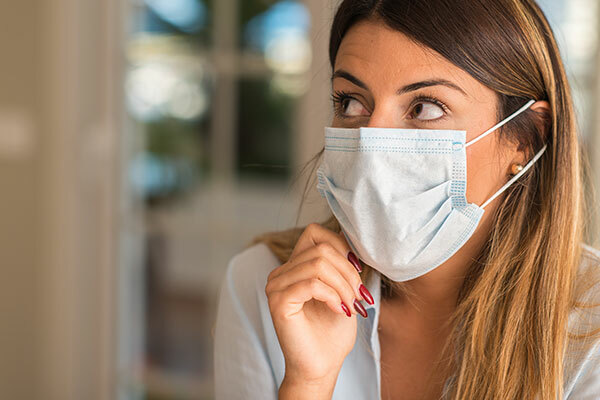 Many of these seemingly harmless things can affect the air quality in your home, and in turn affect the air that you breathe into your lungs. Allergic reactions are one of the leading side effects of poor indoor air quality. Dander from your pets is often the driving force behind many allergy issues in the home. As clean as we think we are when it comes to our animals, their dander will enter the air ducts to circulate throughout your home. This can cause minor discomfort with the sniffles, or it can cause even more serious issues by intensifying asthma attacks along with irritations to the eyes, nose, throat, and skin. These things thankfully can easily be avoided. Getting your air ducts professionally cleaned by Modernistic and keeping an air purifier in the home are two great options for dealing with dirty air! 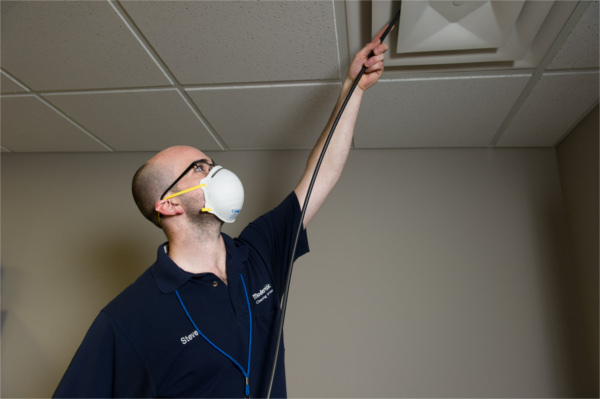 Most of the serious biological pollutants that can cause bacteria and allergy issues can easily be prevented with a thorough air duct cleaning from the Modernistic Air Duct Team. Our crews come to the home prepared, with the most advanced equipment in the industry. We take the dirt with us, leaving your home clean and clear. So please don’t try to do anything crazy to get your HVAC system clean on your own, and make an appointment with the experts. Hope to see you soon! The entryway is an important space; it is the first glimpse visitors get into your home and it is your portal into the outside world! Creating a comfortable and practical space for your family is beneficial to everyone – it helps to have an organized space to start your day! Maintaining a clean and organized entryway is not always easy, so here are 5 tips to keep your entryway clean and clear. If you have hardwood or linoleum in your entry it is a good idea to place a runner or entry mat down to protect your floors from tracked in dirt, mud, rainwater, and salty snow. This will protect the flooring beneath and reduce the amount of cleaning you must do in the area. When it comes time to clean the runner or entry mat be sure to call Modernistic and ask about our area rug cleaning service! If you have carpeting in your entry we recommend a different alternative. Unfortunately, long term use of a runner or doormat can flatten out your carpet’s fibers, which can lead to permanent damage! Instead of covering the carpet with something that could risk damaging the fibers, we recommend you protect the area with an application of 3M Scotchgard. It’s the perfect way to keep your entryway clean. After an application of 3M Scotchgard, your carpet fibers have an extra layer of protection against dirt particles and even water! 3M Scotchgard will actually cause liquid to bead up on the surface, giving you extra time to clean up spills. If you find that your entry stores most of your family’s shoes, consider buying a plastic boot tray. Many stores sell decorative plastic trays, and some even carry wooden boot trays! This collects all the dirt and debris that fall off shoes and ends up on the floor. Boot trays are so easy to clean too: just clear off the shoes, shake it off outside, and wipe it down with hot water and soap! It can also be beneficial to have a “no shoes in the house” rule. You would be surprised how much dirt can come into a home on shoes that, to the naked eye, appear clean! If you don’t have a good space for coats, hats, and scarves, then create one! Find hooks that you like and hang them on an open wall. If you have small children, consider 2 rows of hooks, one higher up and one lower for the kiddos to reach. Your kids will love that they have their own spot for their things. Flat surfaces tend to collect clutter, so make sure everything has its place! Put a decorative bowl in the entryway to collect keys, change, hair ties, and other tiny items. If you have open wall space in your entry, a mirror with hooks can brighten up the area – and gives you a chance to check your appearance before you walk out the door! Use shoe cubbies or baskets to keep shoes out of the way and organized. Storage benches provide a good place to sit and put your shoes on, and can even provide quite a bit of storage. These can be useful for storing winter hats and scarves in the summertime! It can be hard to maintain a clean entryway with kids and pets and friends going in and out of the area all day. In order to keep your entryway clean, it has to be convenient to clean! Keep a spray solution and a roll of paper towels tucked away nearby. After your family returns home each day, a quick wipe down of surfaces and handles will really do wonders in maintaining the area. And it’s always nice to have the paper towels nearby to combat any muddy paw or footprints! What works for one home may not work for yours, but basic organization can go a long way towards reducing mess! Look for storage solutions that work best for your needs. Setting a standard for no shoes in the house is one of the best things you can do to maintain cleanliness. Regular carpet cleaning and area rug cleaning combined with your “no shoes” rule will go a long way to keep your entryway clean and clear! All these things combined will leave you feeling awesome about your entryway, whether you are coming home or heading out the door! Modernistic has been keeping Michigan’s entryways clean for over 45 years! 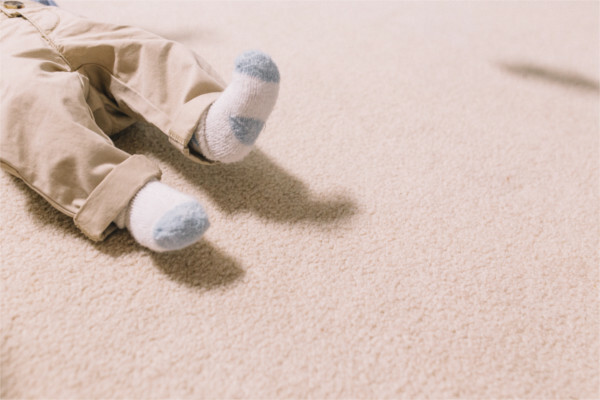 If your carpet could use a professional touch, contact the Local Quality Friendly experts today! It’s springtime in Michigan, and you know what that means: most people are spending a good chunk of their free time cleaning and organizing their homes. People are proud of their homes and want the spaces where they spend most of their time to be organized, clean, and comfortable. Spring cleaning takes time, however, so here are a few Simple & Quick Spring Cleaning tips to help you clean more effectively and efficiently. Utilize these and you’ll get more out of your time spent cleaning and you’ll have more time to spend doing fun things! Using a Cleaning Caddy saves you from running back and forth to the kitchen cupboard for cleaning supplies, which ends up saving time and energy so you can get more work done and move on to fun activities! All you need is your most commonly used cleaning supplies and something easy to carry to store them all in! A Cleaning Caddy is very simple to put together: it is just an easy way to transport all your supplies at once. Some grocery stores make cloth bags designed to hold wine bottles that have 4- 6 little compartments sewn right into the bag. These work really well because they are very light, washable, and will separate your supplies. If you can’t find a cloth-sectioned bag there are other options! Many stores make cheap plastic cleaning totes, and you can always just utilize a regular cloth tote bag if you cannot find a sectioned one. Fill your tote with your most commonly used and favorite cleaning supplies: all-purpose cleaner, glass cleaner, wood cleaner, paper towel, plastic bags (for any trash and used paper towels) and a duster. Take your caddy and have at it. Cleaning can be tough work and can wear you out quickly! One way to make the job easier is to clean in the right clothing. With all the reaching, carrying, scrubbing, and running up and down the stairs, you can heat up quick and get uncomfortable. And discomfort can really slow you down! Pick clothes that you don’t care too much about. There’s really no reason to wear your best yoga pants while picking up the house, they are definitely going to get covered in dust and grime! Choose some loose sweat pants and a breathable t-shirt. You won’t overheat as quickly and when you are done cleaning just toss everything in the hamper. Pro tip: If you know you’ll be working on your knees cleaning the tub or organizing cupboards wear knee pads or buy a kneeling pad from the garden section. It will save your knees and you’ll be able to spend more time working on those areas. To make sure your cleaning time is spent as efficiently as possible de-clutter the areas beforehand. Work room to room. Clear counters and tabletops or items and papers, then clear the floor. If you don’t have time to organize at the moment make a pile of items to organize and put away later. Removing this clutter clears the path for you to come through and clean surfaces without having to stop to move or re-arrange items. Regardless what room you are cleaning in this can help you save time and energy! Start from the top and work your way down. Dust crown molding and clear cobwebs before washing the walls below. Wipe out cupboards before cleaning the countertops below. 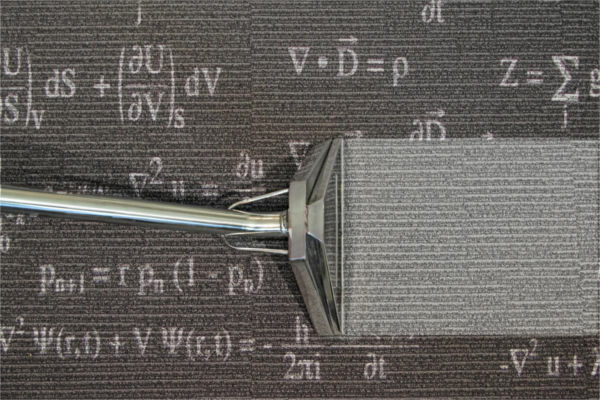 Wipe crumbs from countertops and tables and save sweeping or vacuuming for last. If you follow this top to bottom principle in every room you will avoid dirtying areas you have already carefully cleaned. Make a little checklist for each room of what to clean, working from top to bottom. 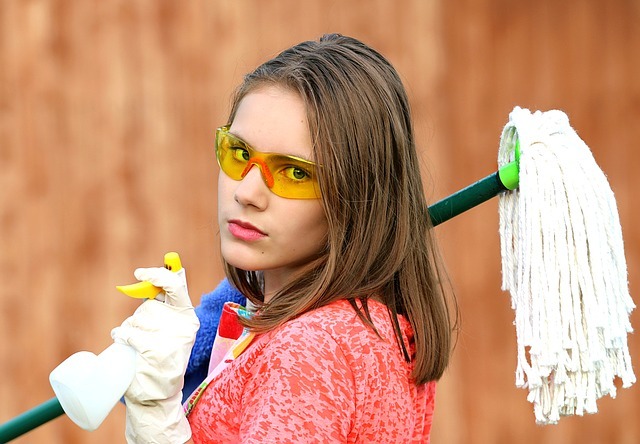 Most cleaning lists have a lot of different tasks on them, some you may be able to complete while working on others. Before moving on to any other tasks get some items going in the laundry and dishwasher. If you do not have a dishwasher soak some hard to clean pots and pans in hot soapy water! Now not only are you working on the task at hand but laundry and dishes are getting done at the same time! Listen for the buzzers or set a timer on your phone to check on the laundry or dishwasher, that way you can keep those machines working while you are working. If you have an essential oil diffuser run that in the rooms you are cleaning to leave them smelling fresh and welcoming. A little bit of multitasking, if carefully done, can go a long way! You have your Spring Cleaning tips, you have your Cleaning Cubby organized, it’s time to turn on the diffuser, get some laundry started, and get to spring cleaning! For over 45 years, Modernistic has been making Spring Cleaning in Michigan Simple & Quick. If you want the freshest carpet, upholstery, tile, and air ducts this season, call or click today!